Is not what I am,"
Said he, "but of financial wisdom." 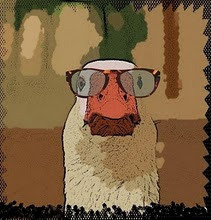 Well, well... playing the animal solidarity card between primates and waterfowl, I managed to escalate this problem to a "Freddie von Chimpenheimer III" in Compliance, to Blake in Client Services, who apologized and reinstated Dr. Goose and his verses. All is well, with geese and chimps once again working hand in wing. From here on out, nothing will stop the daily e-mail delivery of Limericks Économiques (except for the Unsubscribe button). If you or a friend would like to subscribe, use the subscription box on the home page of LimericksEcon.com.